Jesse CARPENTER [Parents] 1 was born 2 in 1859 in Glastonbury, Somerset. He died 3 on 14 Sep 1929 in Llwynpia Hospital, Rhondda. 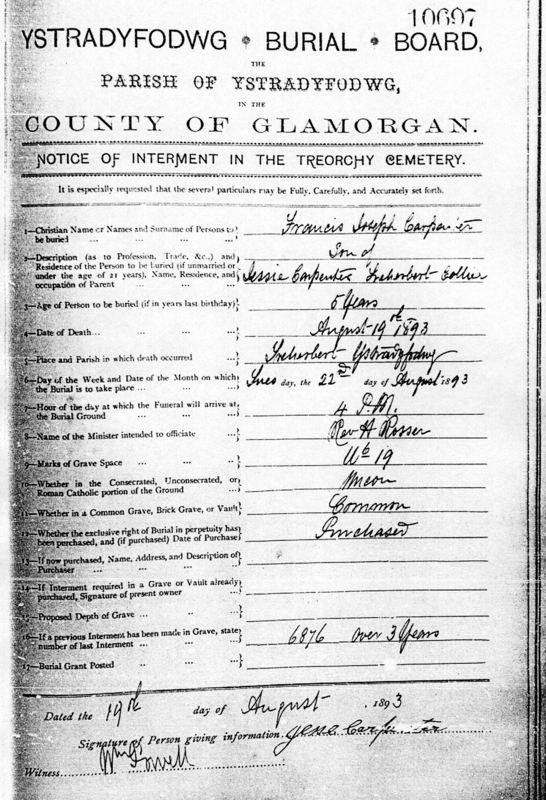 He was buried 4 on 19 Sep 1929 in Treorchy Cemetry, Rhondda, Wales. He married 5 Margaret ABRAHAM on 24 Dec 1882 in Parish Church, Ystradyfodwg. Jesse was employed as Collier on 20 Nov 1883 in Treherbert, Rhondda. He was employed as Collier on 15 Apr 1887 in Treherbert, Ystradyfodwg, Rhondda. He resided 6 in Apr 1891 in 72 Gwendoline Street, Treherbert, Rhondda. He was employed 7 as Coal miner in Apr 1891 in Treherbert, Rhondda, Wales. He was employed as Collier on 19 Aug 1893 in Treherbert, Ystradyfodwg, Rhondda. He was employed as Collier on 25 Jan 1894 in Tynewydd, Ystradyfodwg. He was employed as Collier on 16 Aug 1899 in Treherbert, Ystradyfodwg, Rhondda. He resided on 16 Aug 1899 in 7 Ynyswen Terrace, Treorchy. He resided 8 on 14 Sep 1929 in 140 Ynyswen Road, Treorchy, Rhondda. Margaret ABRAHAM [Parents] was born 1 about 1862 in Aberdare, Glamorgan. She died 2 on 4 Mar 1956 in Treorchy, Rhondda, Wales. She was buried 3 on 8 Mar 1956 in Treorchy Cemetery, Treorchy, Rhondda, Wales. She married 4 Jesse CARPENTER on 24 Dec 1882 in Parish Church, Ystradyfodwg. Margaret resided 5 in Apr 1891 in 72 Gwendoline Street, Treherbert, Rhondda. She resided 6 in Mar 1956 in 166 Ynyswen Road, Treorchy, Rhondda, Wales. M i Frederick Edward CARPENTER was born in Nov 1883 in Treherbert, Rhondda. He died on 20 Nov 1883 in Treherbert, Rhondda. He was buried 1 on 21 Nov 1883 in Treorchy Cemetry, Rhondda, Wales. M iii Griffith Ivor CARPENTER was born 1 in Mar 1887 in Tynewydd, Ystradyfodwg. He died on 15 Apr 1887 in Tynewydd, Ystradyfodwg. He was buried 2 on 18 Apr 1887 in Treorchy Cemetry, Rhondda, Wales. M vi George Edwin CARPENTER [image] was born 1 in Jun 1892 in Tynewydd, Ystradyfodwg. He died on 25 Jan 1894 in Tynewydd, Ystradyfodwg. He was buried 2 on 27 Jan 1894 in Tynewydd, Ystradyfodwg. F viii Doris CARPENTER [image] was born about Jan 1899 in Treorchy, Ystradyfodwg, Rhondda. She died on 16 Aug 1899 in Treorchy, Ystradyfodwg, Rhondda. 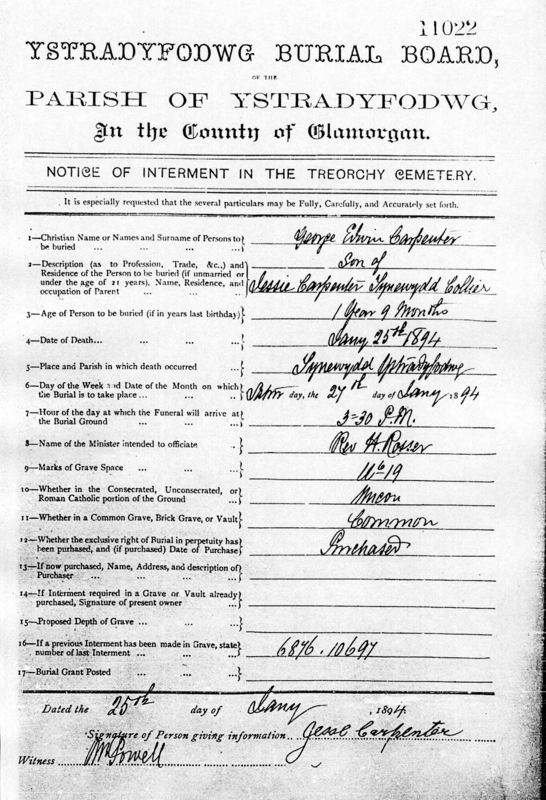 She was buried 1 on 19 Aug 1899 in Treorchy Cemetery, Treorchy, Rhondda. Abraham ABRAHAM died in Mar 1873 in Pontypridd District. He married 1 Ann HUGHES in Mar 1862 in Merthyr Tydfil. Ann HUGHES was born about 1817. She died 1 in Jun 1896 in Merthyr Tydfil. She married 2 Abraham ABRAHAM in Mar 1862 in Merthyr Tydfil. Edgar Ambrey BIGGS [Parents] was born 1 in Jun 1883 in Cardiff, Glamorgan, Wales. He died 2 on 11 Sep 1930 in 6 St Albans Terrace, Blaencwm, Rhondda. 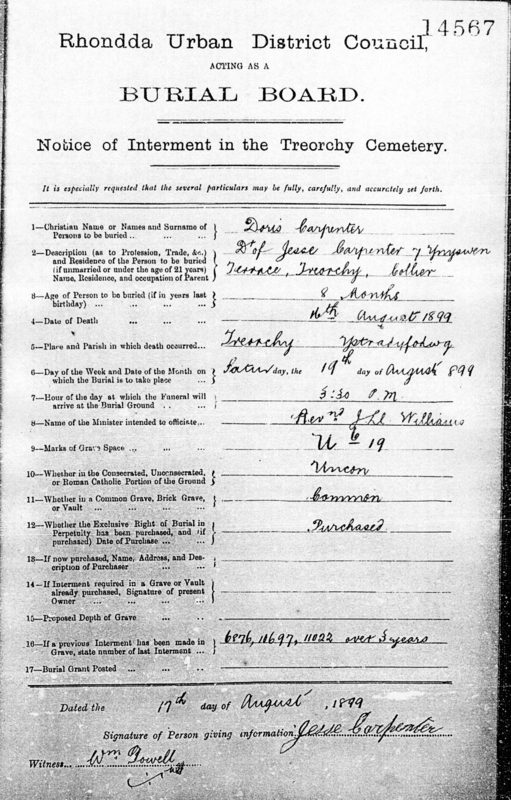 He was buried 3 on 16 Sep 1930 in Treorchy Cemetery, Treorchy, Ystradyfodwg. He married May. Edgar was employed 4 as House Painter in 1901 in Neath, Glamorgan, South Wales. He resided 5 in 1901 in 25 Lewis Road, Neath, Glamorgan, Sout Wales. He was employed 6 as Painter on 11 Sep 1930 in 6 St Albans Terrace, Blaencwm, Rhondda. He resided 7 on 11 Sep 1930 in 6 St Albans Terrace, Blaencwm, Rhondda. May was buried in Neath. She married Edgar Ambrey BIGGS. Oliver FRATER [Parents] was born 1 on 1 Dec 1851 in St Pancras, Middlesex, London. He was christened on 7 Mar 1852 in Old Church St. Pancras, London. He died 2 in Mar 1921 in Marylebone District. He married 3 Ellen BUTLER on 21 Mar 1869 in The Church, Parish St James the Great, Bethnal Green. Oliver resided 4 on 1 Dec 1851 in 21 Henriette Street, Bloomsbury. He was employed 5 as French Polisher on 21 Mar 1868 in Bethnal Green. He resided 6 on 21 Mar 1869 in 10 South Street, Bethnal Green, London. He resided 7 on 12/23 Nov 1889 in 9 Andover Gardens, Islington, London. He was employed 8 as House Painter in 1901 in Islington, London. He resided 9 in 1901 in 4 Andover Gardens, Islington, London. Ellen BUTLER [Parents] was born 1 on 24 Nov 1851 in 7 Chapel Road, Stoke Newington. She died 2, 3 in Dec 1914 in Edmonton. She married 4 Oliver FRATER on 21 Mar 1869 in The Church, Parish St James the Great, Bethnal Green. Ellen resided 5 on 21 Mar 1869 in 3 South Street, Bethnal Gree, London. She resided 6 on 12/23 Nov 1889 in 9 Andover Gardens, Islington, London. She resided 7 in 1901 in 4 Andover Gardens, Islington, London. James FRATER [Parents] was born in 1819 in Scotland. He died 1 in Sep 1891 in Islington, Middlesex, London. He married 2 Sarah Ann WELCH on 20 Jul 1845 in St Pauls, Wilton Place, St George Hanover Square. James was employed 3 as Brassturner on 21 Mar 1869 in Bethnal Green. He was employed as Printer Compositor in 1881 in London. Sarah Ann WELCH [Parents] was born 1 on 31 Aug 1826. She was christened 2 on 24 Sep 1826 in St James. Westminster, London. She died 3 in Jun 1898 in St Pancras, London. She married 4 James FRATER on 20 Jul 1845 in St Pauls, Wilton Place, St George Hanover Square. David Charles FRATER [Parents] was born on 9 Jul 1917 in Carms. He died on 1 Aug 1990 in Prince Philip Hospital, Llanelli. The cause of death was heart attack. He was buried in Llandyrry Church, Trimsaran. He married 1 Joyce BIGGS on 11 Jul 1950 in Registry Office Llanelli. David resided 2 in 1940 in 146 Garden Suburbs, Trimsaran, Nr Kidwelly S. Wales. Joyce BIGGS [Parents] 1 was born on 17 Sep 1922 in Carms. She died on 5 Jan 1993 in Trimsaran, United Kingdom. The cause of death was Brain Haemmorige. She was buried in 1993 in Llandyrry Church, Trimsaran. She married 2 David Charles FRATER on 11 Jul 1950 in Registry Office Llanelli. Joyce resided 3 in 1930 in 146 Garden Suburbs, Trimsaran, Nr Kidwelly S. Wales. David Charles FRATER [Parents] was born on 9 Jul 1917 in Carms. He died on 1 Aug 1990 in Prince Philip Hospital, Llanelli. The cause of death was heart attack. He was buried in Llandyrry Church, Trimsaran. He married 1 Dulcie May (Maud?) BIGGS on 9 Nov 1943 in Llandyry Church, Trimsaran, Parish of Pembrey. David resided 2 in 1940 in 146 Garden Suburbs, Trimsaran, Nr Kidwelly S. Wales. Dulcie May (Maud?) BIGGS [Parents] was born on 30 Jun 1920. She died on 14 Apr 1945. She was buried on 18 Apr 1945 in Llandyry Church, Dyfed. She married 1 David Charles FRATER on 9 Nov 1943 in Llandyry Church, Trimsaran, Parish of Pembrey. Dulcie resided 2 in 1930 in 146 Garden Suburbs, Trimsaran, Nr Kidwelly S. Wales. Edward FRATER [Parents] was born 1 on 12 Nov 1889 in 9 Andover Gardens, Islington, London. He died on 28 Dec 1957 in Trimsaran Carms. He was buried in Llandyry Church,Dyfed,S.Wales. He married Elizabeth LEWIS on 28 Nov 1914 in The Register Office Carmarthen. Edward resided 2 on 12/23 Nov 1889 in 9 Andover Gardens, Islington, London. Elizabeth LEWIS [Parents] was born 1 about 1894 in Llangendeirne, Carmarthenshire. She died on 10 May 1963 in 51 Garden Suburbs, Trimsaran, S. Wales. She was buried in Llandyry,Dyfed,S. Wales. She married Edward FRATER on 28 Nov 1914 in The Register Office Carmarthen.